What is combined heat and power generation? Combined heat and power generation (CHP) is technology which uses the process of cogeneration to provide the simultaneous generation of electricity and useful heat. This contrasts with conventional ways of generating electricity, where vast amounts of heat is wasted. In a conventional coal and gas fired power station, up to two thirds of the energy is consumed in this way and is often lost as steam. By using a CHP unit, the heat generated to produce power is instead used for domestic hot water and central heating backup. What savings can be made from installing a CHP unit? Yes, by generating your own power you will be significantly reducing your carbon footprint. This is because you will no longer be solely relying on power station generated electricity and instead you will be making use of the heat produced when power is generated. CHP units powered by natural gas can reduce your carbon emissions by around 20%, whilst this figure increases to 30% if you are using one of our systems powered by biofuels or biogas. How can CHP be used with other heating systems? Yes, Viessmann system technology allows all of our heating systems to be used in-conjunction with one another. Our CHP units work particularly well with our biomass boilers, photovoltaics and ground source heat pumps. Do I need planning permission for a CHP? No, planning permission for a CHP unit is not usually necessary. The only example of it being needed is if your property is listed or if the unit is being installed in an area which would affect the public view of your property. 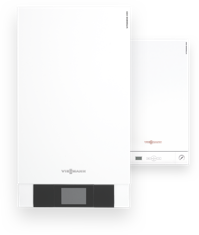 The incredibly efficient, cutting-edge Vitovalor represents the latest in heating technology. The system combines economic heat and power generation on a very small footprint. The ideal future-thinking energy centre for modern family homes. The Vitovalor is a fuel cell heating appliance that uses the principle of cogeneration to generate both power and heat. Discover how it works with our simple guide.